The last stop of my upcoming US trip will be San Francisco. There I will present a paper on the possibilities of predicting German elections based on Twitter chatter at this years at the workshop Politics, Elections and Data – PLEAD2013 during this years Conference on Information and Knowledge Management (CIKM 2013). The organisers, Ingmar Weber [@ingmarweber], Ana-Maria Popescu [@hintikka] and Marco Pennacchiotti [@zagarolo] have put an exciting program together so I am looking very much forward to the workshop and the following discussion. Here is the abstract to the paper. As the microblogging service Twitter becomes an increasingly popular tool for politicians and general users to comment on and discuss politics, researchers increasingly turn to the relationship between tweets mentioning parties or candidates and their respective electoral fortunes. This paper offers a detailed analysis of Twitter messages posted during the run-up to the 2009 federal election in Germany and their relationship to the electoral fortunes of Germany’s parties and candidates. This analysis will focus on four metrics for measuring the attention on parties and candidates on Twitter and the relationship to their respective vote share. The metrics discussed here are: the total number of hashtags mentioning a given political party; the dynamics between explicitly positive or explicitly negative mentions of a given political party; the total number of hashtags mentioning one of the leading candidates, Angela Merkel (CDU) or Frank-Walter Steinmeier (SPD); and the total number of users who used hashtags mentioning a given party or candidate. The results will show that during the campaign of 2009 Twitter messages commenting on parties and candidates showed little, if any, systematic relationship with subsequent votes on election day. In the discussion of the results, I will raise a number of issues that researchers interested in predicting elections with Twitter will have to address to advance the state of the literature. Andreas Jungherr. 2013. “Tweets and Votes, a Special Relationship: The 2009 Federal Election in Germany.” In Proceedings of PLEAD’13, November 1 2013, San Francisco, CA, USA. New York, NY: ACM. The second stop of my upcoming US trip will be Chicago. There on October 30, I will give an invited talk at the Department of Communication of the University of Illinois at Chicago. I will talk about the use of Twitter during one of the most contentious protests in Germany’s recent past, the protests against the infrastructure project Stuttgart 21. The talk is based on two papers I have written with Pascal Jürgens. Andreas Jungherr, and Pascal Jürgens. 2013. “Through a glass, darkly: tactical support and symbolic association in Twitter messages commenting on Stuttgart 21.” Social Science Computer Review (Online First). Through a glass, darkly: Tactical support and symbolic association in Twitter messages commenting on Stuttgart 21. Political actors increasingly use the microblogging service, Twitter, for the organization, coordination, and documentation of collective action. These interactions with Twitter leave digital artifacts that can be analyzed. In this article, we look at Twitter messages commenting on one of the most contentious protests in Germany’s recent history, the protests against the infrastructure project Stuttgart 21. We analyze all messages containing the hashtag #s21 that were posted between May 25, 2010, and November 14, 2010, by the 80,000 most followed Twitter users in Germany. We do this to answer three questions: First, what distinguishes events that resulted in high activity on Twitter from events that did not? Second, during times of high activity, does the behavior of Twitter users vary from their usual behavior patterns? Third, were the artifacts (retweets, links) that dominated conversations during times of high activity indicative of tactical support of the protests or of symbolic association with it? On my upcoming trip to the United States I will give a talk at Wellesley College, Boston on October 25. The topic will be the analysis of political events through data collected on Twitter. Here is the abstract for the talk. I am very much looking forward to this talk and on engaging in the ensuing discussion. The microblogging service Twitter is increasingly becoming a tool for political communicators and the public in various countries to communicate about politics. This is also true in Germany. 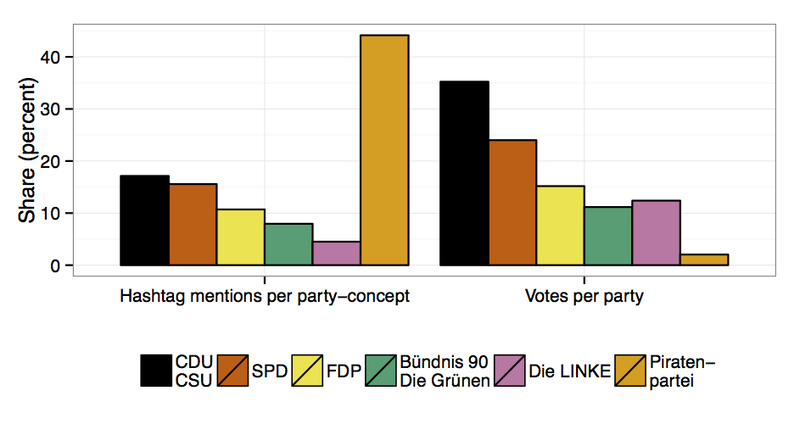 Germany offers an interesting case to analyze the impact of Twitter on political communications. Since 2009, Twitter has been a central tool in election campaigns, political activism, the self-marketing of politicians, and the media coverage of campaigns. The talk will address recent research on the use of Twitter during the campaigns for the federal elections 2009 and 2013 and during one of the biggest political protests in Germany’s recent past, the protests against the infrastructure project Stuttgart 21. 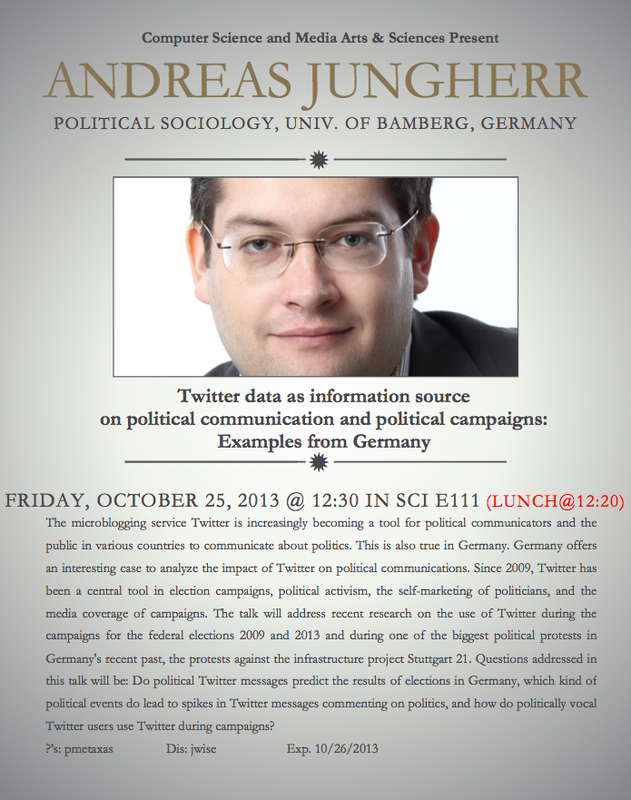 Questions addressed in this talk will be: Do political Twitter messages predict the results of elections in Germany, which kind of political events do lead to spikes in Twitter messages commenting on politics, and how do politically vocal Twitter users use Twitter during campaigns?